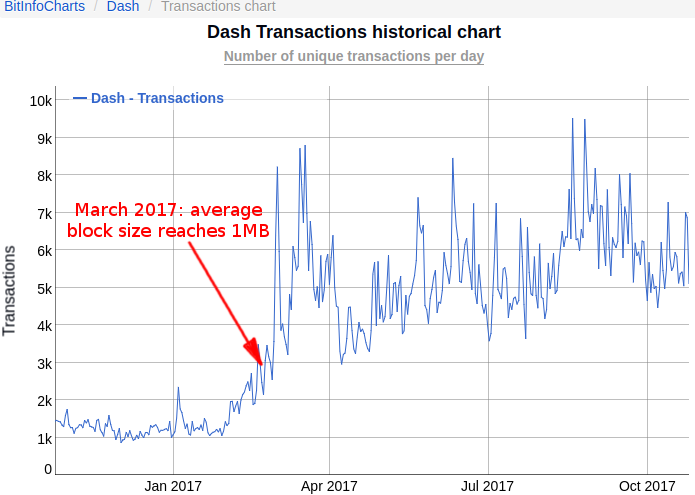 March 2017 was a significant moment for Bitcoin: the average block size bumped into the 1MB limit, stunting the growth of the transaction rate ever since. Many arguments are made about how to increase capacity (changing the limit, developing off-chain solutions, etc.) However very rarely are discussions centered around facts and data such as estimating the impact of the stunted growth so far and the urgency of the situation. Also troubling is the widespread misconception that the activation of segwit on August 24th has given Bitcoin short-term relief. In reality, I estimate Bitcoin missed the opportunity to process over $20 billion of transactions. 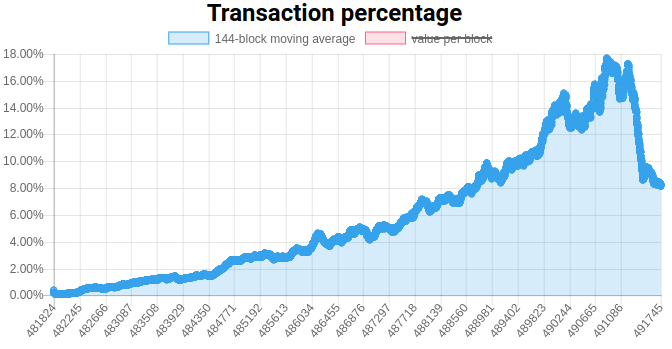 Low segwit adoption keeps the network seriously congested to this day: over 90% of blocks are over 90% full. And given the current rate of increase of segwit adoption, the network will likely remain congested for the foreseeable future. Up until March 2017 the transaction rate growth was predictible. Had there not been a 1MB limit, it seems the market demand for transaction capacity would have been for approximately 1.2MB blocks today. By failing to capture an extra 0 to 0.2MB of transactions, that is 0 to 20% extra transactions through the period March to October (daily transaction volume of $300-1000 million) Bitcoin failed to capture $20 billion worth of transactions over the last 7 months. I have to touch the subject of the mempool because the human—not technical—dynamics that affect its functioning are often misunderstood. 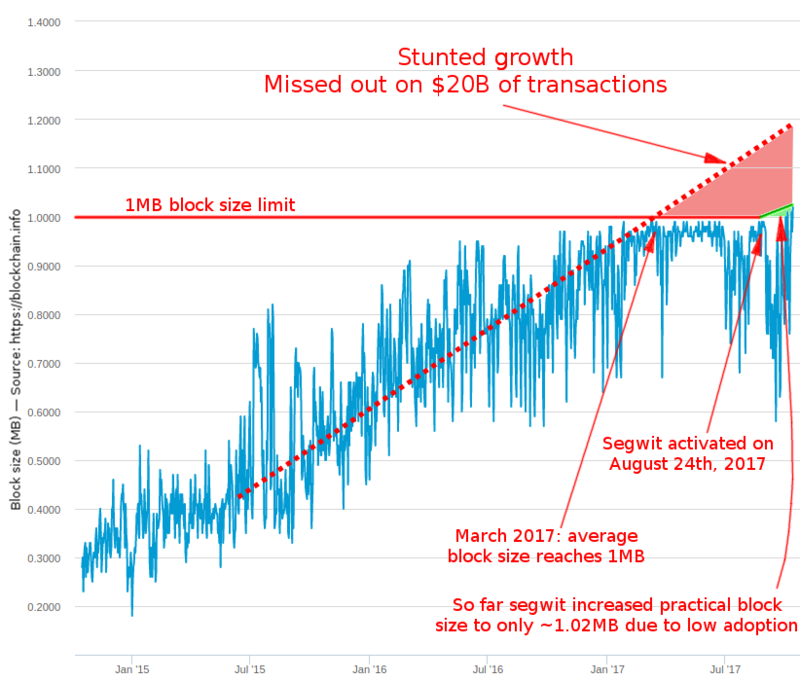 It is a mistake to think that “if the mempool is not growing, then Bitcoin is not congested.” When congestion begins, the mempool starts growing, some transactions in it are delayed 1 day, 2 days, 4 days… eventually some users lose patience and avoid sending transactions (Bitcoin fails to capture them), hence reducing pressure on the mempool, which starts shrinking until it is back to normal or even empty. And the cycle repeats immediately: users send more transactions, the mempool grows, they lose patience, and avoid Bitcoin, etc. Under perpetual congestion conditions the mempool will never grow indefinitely. No! Segwit replaced the size limit of 1MB with a weight limit of 4 million weight units (“4M”). Therefore the size of blocks in bytes is no longer relevant to estimate the level of congestion. Instead we need to look at the weight of blocks in weight units. For example average blocks of 1MB/4M would indicate congestion, while larger blocks of smaller weight such as 1.5MB/3M would indicate no congestion. An argument I sometimes hear is that “there is no severe congestion, because if there was, segwit adoption would increase more sharply.” This is flawed reasoning because other factors—independent of congestion—slow down segwit adoption: wallet software and services are not upgraded to use segwit by default, users are unaware of how to use segwit or why they need it, etc. 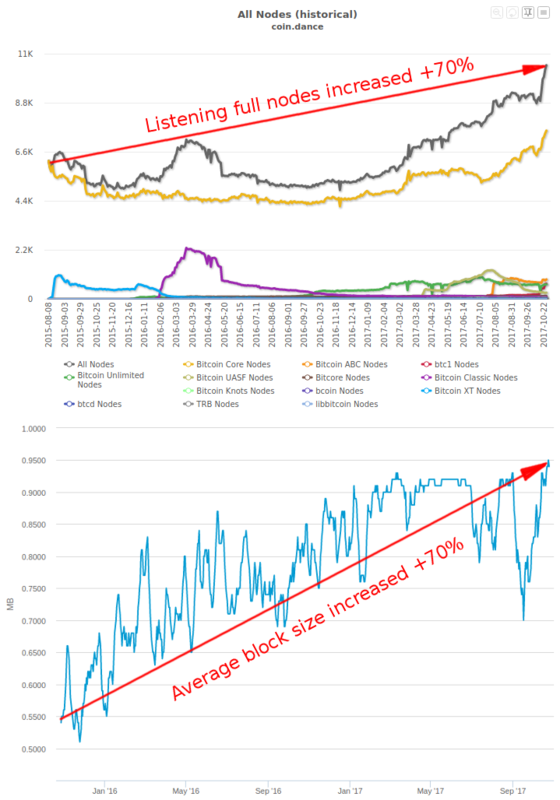 So Bitcoin blocks have been full since March. What else happened in March? 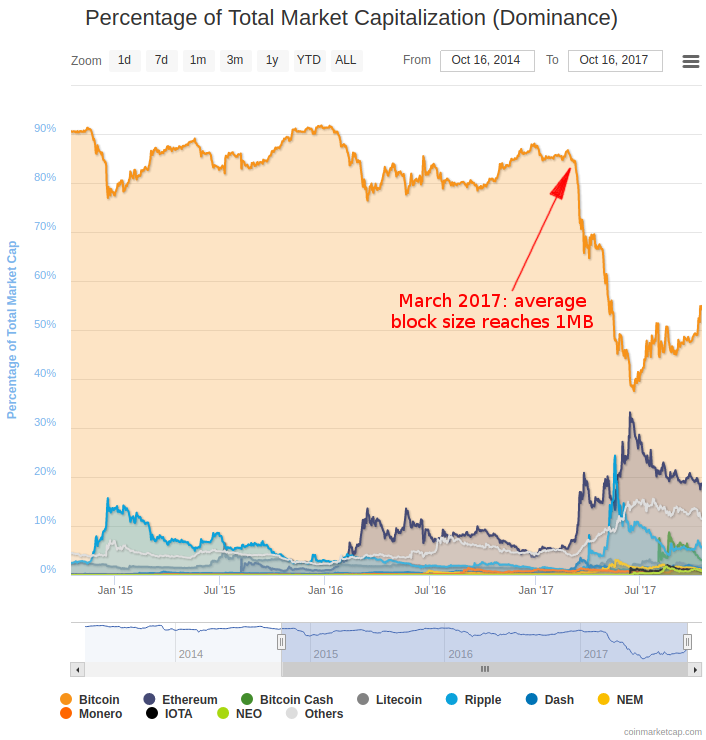 Bitcoin lost market share, from 85% down to 55%. In my humble opinion, the coincidence of the drop starting exactly in March is a sign that the congested network was the direct cause of Bitcoin’s loss. 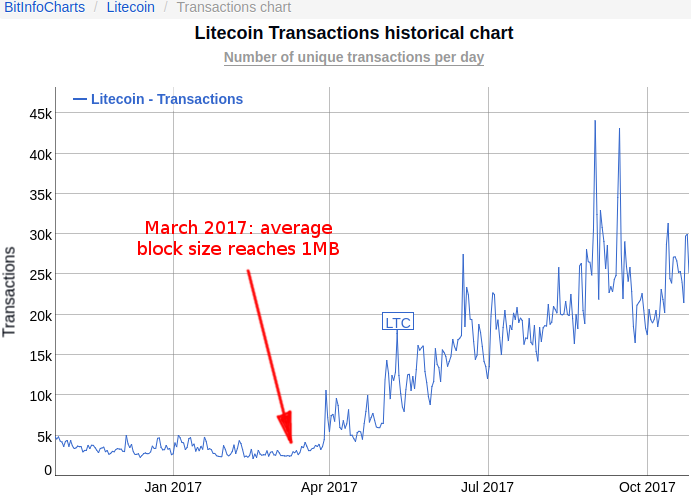 This could be explained by one theory: users being fed up with the congested network and high transaction fees, and moving to altcoins with less congestion and lower fees. If anything, this is more evidence potentially validating the theory that some users are abandoning Bitcoin for altcoins due to congestion. Another explanation about why Ethereum’s transaction rate went up so sharply is because of the ICO boom. However ICOs are hardly responsible for all of it, and they do not explain the rise in Litecoin and Dash which are much less often used to fund ICOs. 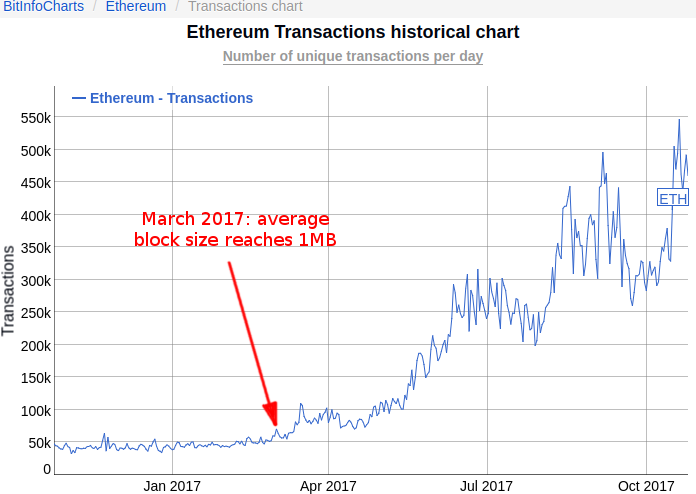 Notice that Ethereum already processes 450k transactions daily, which is 70% more than the 260k processed by Bitcoin… This might be a slightly unfair comparison because unlike Ethereum, some Bitcoin transactions are batched. To be more correct we should compare the number of Ethereum transactions to the number of Bitcoin transaction outputs (and for transactions with 2 or more outputs, subtract 1 because one of them is likely the change output.) However batching is not that common so the comparison between the number of Ethereum and Bitcoin transactions is mostly valid. How do we resolve Bitcoin’s congestion? Instead of increasing the block weight limit, I think we all agree more ideal solutions would be the Lightning Network, Mimblewimble, transaction batching, etc. However these solutions are either not ready or not practically usable at scale today. In essence this is the root cause of the scaling debate: the community is divided between big blockers who want a pragmatic quick fix, and small blockers who are more idealistic. Will increasing the block weight limit hamper decentralization? I do not believe so. Firstly, the amortized cost of running a full node is only $5 per month, an amount small enough that running one is within reach of enough individuals to protect decentralization. Fun comparison: the average transaction fee right now is over $3, therefore running a full node costs less than the fees for sending 2 Bitcoin transactions a month. It is easy to get distracted by all the good news Bitcoin has been receiving lately: all-time-high price around $6000, a lot of venture capital injected into Bitcoin companies, etc. However this rapid success could disappear just as quickly if Bitcoin fails to increase its capacity soon. Bitcoin needs a pragmatic fix, a one-time reasonable increase of the block weight in order to relieve congestion right away and give us some breathing room. We can do this while keeping the costs to run a full node low ($5/month) and the network decentralized. reggz wrote: Salut! Great blog and great article, thank you. I'm not at all enthusiastic about this battle of egos and agendas that's become the scaling debate. I think the lack of consensus and deployed means towards adopting Segwit is actually a little sad. You're one of the rare person I read who presents a sound set of arguments for the larger-blocks side of the debate (props for that). I also agree that a "one-time pragmatic fix" would help, but I don't think it can happen because each side has become so infatuated with their own ego and ideologies, that the bias seems to me now irreversible. It comes down to deciding which developers you want to trust the most, and which community do your thoughts align with the most. For me, the answer to that is evident. Is it that picking a side on this debate is dumb, and that we should only go for the most pragmatic options? Or are you firmly positioned in one end of the debate? Or are you being a contrarian for the sake of argumentation? Or do you have an issue with particular devs? Anyways, je vis a bernal heights a SF et en californie depuis des années. Pti' bonjour d'un autre geek francais du coin :) (PS: Si tu joues du jazz/funk, fais signe! ).